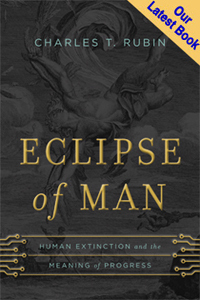 I am not ungrateful to Issues in Science and Technology for presenting, in its spring 2016 issue, a review (available here) of my book Eclipse of Man: Human Extinction and the Meaning of Progress. I wish it were not such a negative review. But as negative reviews go, this one is easy on the ego, even if unsatisfying to the intellect, because so little of it speaks to the book I wrote. The reviewer gets some things right. He correctly points out, for some reason or other, that I teach at a Catholic university, and also notes that the book does not conform to the narrow dogma of diversity that says that in intellectual endeavors one must always include discussion of people other than dead or living white males. All true. On the other hand, the reviewer also claims that “a good third of the book is devoted to lovingly detailed but digressive plot summaries.” He also speaks of my “synopses” of Engines of Creation and The Diamond Age. This is a very telling error. Actually, about 4 percent of the book (9 of 215 pages, by a generous count) is devoted to plot summaries of the fictional works that play a large role in my argument. How do we get from 4 percent to 33 percent? The reviewer apparently cannot discern the difference between a plot summary and an analysis of a work of literature or film. These analyses are indeed “lovingly detailed” because they involve a close reading of the texts, and a careful effort to understand and respond to the issues raised by the authors of the works in question. The same goes for my reading of Drexler; it is an analysis, not a summary or general survey of his book, as is asserted by calling it a synopsis. Now, it may be my failure as an author that I could not interest the reviewer in my arguments as they emerged from such analyses, and of course those arguments may be wrong or in need of revision in a host of ways that a serious review might highlight. But my reviewer avoids mentioning that the book has any arguments at all. 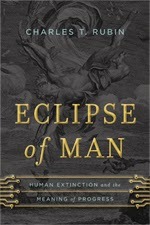 For example, a key theme of the book, announced early on (page 15), is that if we want to understand transhumanism, we need to see how it emerged out of an ongoing intellectual crisis that faced Enlightenment views of material progress when they had to face the challenge of Malthusianism and Darwinism. This point is right on the surface, consistently alluded to, and is one of the main threads holding the book together. Yet you would know nothing of it from the Issues in Science and Technology review. There is one point raised by the reviewer which is substantive and worth thinking about. He accuses me of recommending modesty when I should have recommended humility. Oddly, he does so in a mocking way (“Are we to establish a federal modesty commission to enforce a humble red line...?”) when of course his own suggestion could just as easily be made to look unserious (Are we to establish a federal humility commission?). Every major technical advance or scientific insight leads to the opening up of a vast world of undreamed-of complexity that mocks the understanding we thought we’d achieved and dwarfs the power we hoped we’d acquired. This is a beautiful, poetic sentiment. But it is quite irrelevant to the crucial question of how to deploy the new knowledge and powers that we are plainly achieving. Self-directed genetic evolution, for example, may indeed be far more difficult to achieve than was once thought, but that does not at all mean that we are not on path to gaining the knowledge and ability to undertake it. Even if it were true that we always overstate our powers, that does not mean we are not becoming more powerful, and in such a way as to encourage us to think that more power is coming. And it certainly does not mean that, as a moral question, there are not many who, eschewing both modesty and humility, are anxious to travel that road.